It seems that buzz is far greater than just a hum perceived in the ears. It’s a broader vibrational experience which, although I know scientifically speaking makes sense, since our bodies are made up of energy, still makes me uncomfortable. Not only does the nada, which represents the “unstruck sound” (see below), represent the deathless beautifully; it’s supposedly a great object for concentration practice because once you hear it, it’s more or less always there (as long as awareness is). Ajahn Sumedho says “The sound of silence is like infinite space because it includes all other sounds, everything…other sounds come and go, change and move accordingly, but it is like a continuum, a stream.” In theory, great. Yet, for that very reason – the perception of permanence – like physical pain, it sometimes becomes overbearing and the mind just keeps glomming onto the sound until something else drowns it out. The perception of vibration starts to become oddly “solid”, unchanging. Although it probably appears to you gracious readers as if there’s strong aversion to the sound or experience itself, with some investigation it’s clearly more aversion of aversion (i.e., “I shouldn’t be struggling with this, I should just be opening up to what’s happening…”) and of all the story line it’s wrapped up in. I’ve always been religious or spiritual but also disliked both words. I’ve never wanted to be perceived as New Agey, even though several of my early influences were people who would definitely be classified as such. So talking about cosmic hums, vibration, the energetic aspects of the body – well, not my favorite. Meanwhile, the little energy work I’ve done with acupuncture or laying on of hands (my friend is a healer), always results in the same assessment: that I have blocked energy (qi) or even armor around the energy field. Another friend who does psychotherapy based in somatic experience and has done some massage therapy on me says that much of this suggests early trauma. I begin to believe these stories. Whether they are true or not doesn’t matter; they are stories nonetheless, because all that came before becomes a story in our mind and memory. And this is what the ego attaches to and resists, and with which it creates what sometimes seem like insurmountable walls. Perception, storyline, thoughts…these are our normal habits of mind and they are also what present hurdles for us in our practice; hurdles (and opportunities) that if received with wise view, i.e., a good, welcoming attitude, which recognizes this isn’t personal, are dissolved into insight about the nature of reality. Sometimes they hang around for a while, until of course the appropriate causes and conditions line up for understanding to emerge. In the meantime, I’ll blog about it. Of course articulating the causal relationships certainly helps to begin to loosen the conceptual knots we’ve created, so it’s all part of the practice. Thanks, Katherine, for another profound post. Interesting, because now I can get the PDF according to the provided link. Is this impermanence? Thanks for this interesting, well researched and most informative article. The “sound of silence” is also discussed in the introduction by Ajahn Amaro to Ajahn Sumedho’s book “The Sound of Silence” on pages 6-8. He mentions that books have been written on it and cites “The way of inner vigilance” by Salim Michael http://www.edwardsalim-michael.org/livres.htm. I believe Ajahn Sumedho says that “the sound of silence” is not something to seek or force but open to or allow with receptive awareness so I need to be patient. There is always the breath and body as meditation objects. Dear Terry, thanks for your comment and for the extra reference. My experience is, while on retreat in Burma, where there was so much ambient noise all the time (chanting over loud speakers, village life, gongs, bells, etc. ), I really didn’t have the opportunity to tune into the sound of silence. But then, I spent five weeks in a quieter location and, really early in the AM, before everyone else had awakened, the sound became almost deafening! That first sitting of the day especially. Now, I live in a very rural environment. When I first returned from retreat, the sound of silence was by far the most prevalent heard sense. As the mind got busier, it would come and go. Almost always now, when I lie down to go to bed and begin to relax, or when I sit down for formal meditaiton, or as I’m waking up – the sound is very prominent. Just last night, I heard a high pitch buzz and knew it was not this sound. It was a funny conversation I had with my mother, who’s convinced she has tinnitus and could not hear what I was hearing because she said the buzz she heard was only “in her head” and was drowning out anything else. I knew it wasn’t the same buzz that was in my head, however, because it had a distinctly mechanical sense to it. Out of curiosity, I fiddled with the light switches, and in fact, it was the single light bulb chandelier hanging over the table. Thanks so much Terry. Back in the woods and the nada is ever-present again. Attitude is very different (that is, much more right attitude) so it will be interesting to practice with. From my experience not so sure I agree with Aj Sumedho that one is experiencing no-thought if hearing the sound of silence. Agree that if there is just the pure experience of it, as nature, that in itself is the understanding of “not personal, not me or mine”, but that’s right view which comes and goes ;) The sound of silence too, but not necessarily simultaneously! We should explore this thought / no-thought thing some more. I have a few posts that will go up on Tumblr today. 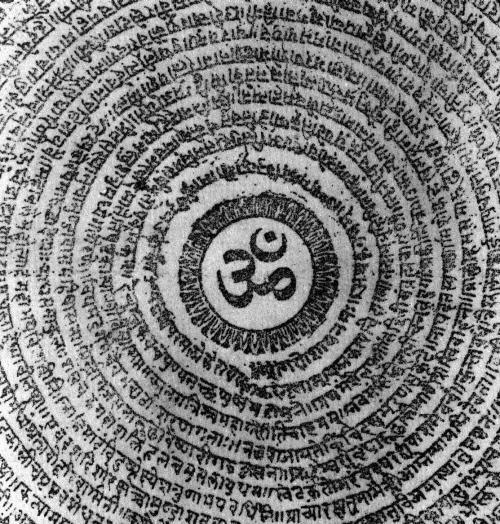 looking for a long time at the image of the OM/Aum text in your essay, I was amazed at the concentration that the writing of that required. definately sacred for so much mindfulness had to be expressed. After a very profound experience ten years ago on a vippasana retreat the sound came up and never left. it does fade into the background when I am busy but when I am quiet it will arrise and when I meditate it becomes really loud. Never had an aversion to it. I recently began using it as my main focus of attention but also awareness of sensation and the breath. It seems as if I am in tune with the universal energy and that it removes blocks and ill health. The mind gets excited by this and result orientated as is its habit. I can feel quite deppressed for a while after an intence meditation as if the ego is upset by it or the negativity it stirs up and releases can linger and cloud the mind.